ANDRITZ develops and manufactures submersible motors for various fields of application in water supply, mining and offshore. Equipped with a special cooling technology (MCT) and an interior permanent motor technology (IPM), ANDRITZ submersible motors achieve impressive performance values, efficiencies, and cost savings. 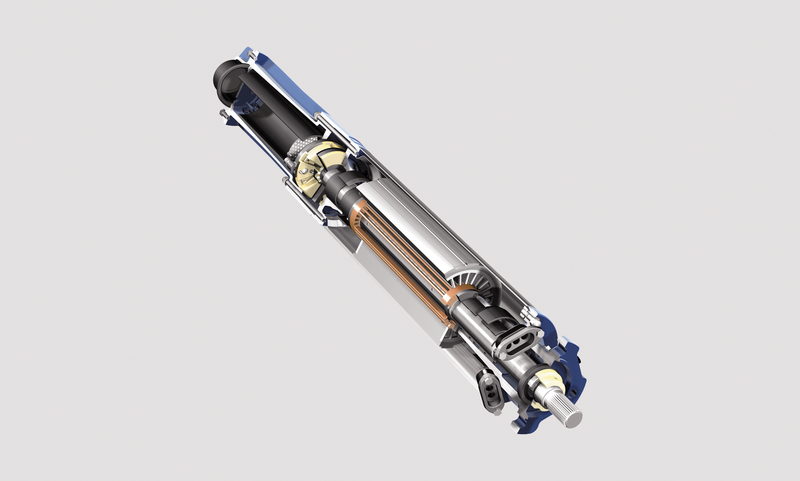 Their rewindable winding makes ANDRITZ submersible motors from the SM series the ideal drivers for submersible deep well pumps, bottom intake pumps, seawater lift pumps, and for subsea machinery. Thus, they can be used for water supply and in the offshore as well as the mining industry. They are designed as water-filled and water-cooled three-phase asynchronous motors with squirrel-cage rotors with a mechanical shaft seal. Depending on the field of operation, ANDRITZ submersible motors from the SM series can be made of cast iron, bronze or stainless steel and can be installed vertically and horizontally. For more information on our submersible motors please have a look at our brochures in the sidebar or contact us directly. Efficient and cost-effective cooling of submersible motors is a constant source of discussion by well and mine operators. Derating is a less-than-ideal solution. In addition to high capital and energy costs, the overlarge, downgraded motors usually require a larger well diameter. Oil cooling needs careful consideration as well – any failure can cause ecological damage. ANDRITZ motors are equipped with the innovative modular cooling technology (MCT ), enhancing durability and also being the most efficient possible means of cooling submersible motors. The absolutely maintenance-free motors use potable water as cooling fluid and can be installed in media up to 75° C. A pump impeller brings movement into the cooling circuit and thus provides flow in the right direction. Our own development cooling channels ensure heat absorption at all thermal sources and heat evacuation, as well as providing optimal heat conduction through the outside of the motor to the flow medium. The additional use of heat exchanger modules allows precise dimensioning of the cooling capacity. For more information on our modular cooling technology please have a look at our brochures in the sidebar or contact us directly. ANDRITZ interior permanent motor technology (IPM) uses a rotor with integrated permanent magnets. Existing asynchronous motors thus become permanent-magnet synchronous motors with impressive performance values: average efficiency increases of 4% and in the partial load ranges, as much as 7% at levels above 90%. Speaking of flexibility, IPM motors perfectly complement our modular shaft pump technology (MS-T). Through simple mounting and demounting the MS-T stage modules, the discharge pressure of the pump can be flexibly adjusted to meet the respective operating conditions. For more information on our interior permanent motor technology please have a look at our brochures in the sidebar or contact us directly.